I'm going to cover the controller in the triangle with coroplast tomorrow to make it a little more stealthy/less bomb-looking, then I'll post some pics of the bike and bag. Here's a pic of the bomb-esque stuff inside the cover I made. I'll post a pic of the outside later. It only covers the front ~2/3rds of the triangle so the controller can still get some cooling. Should keep the connectors pretty dry in the rain. Too bad the battery doesn't fit in there instead. Is your controller going to get water inside from the wire grommets facing up? 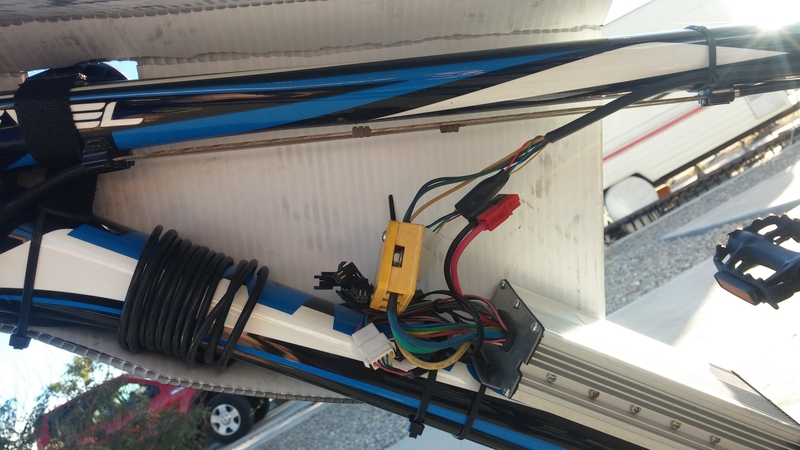 The controller actually spent several months mounted wires-up out in the weather, still works. This setup should keep it plenty dry in comparison. Rode to work today, everything felt great! Only complaint is that the backpack straps could still use some fine tuning. Currently at 1110 miles for this kit, over 1700 miles on the battery. I think I'm pretty close to perfecting the setup with this frame, motor, and battery, which makes my wallet happy. Fenders are the only other must-have and brake and turn signal lights would be nice. 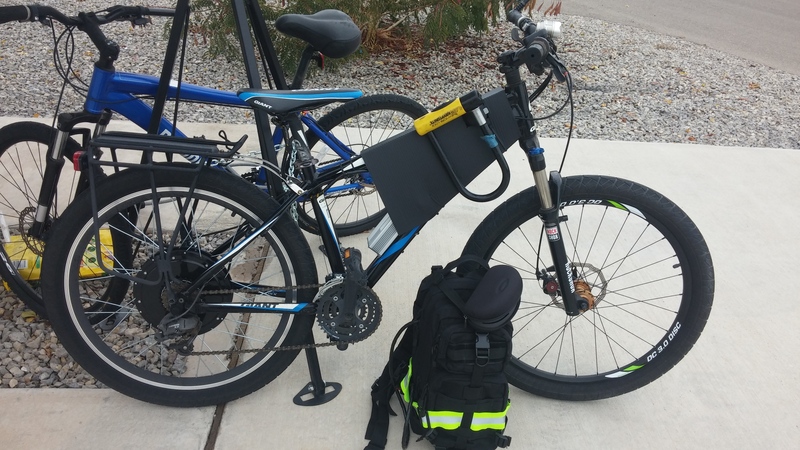 Here's a pic of the bike and backpack. Having the lock up there saves me from digging it out of the bag and it puts a little more weight on the front. 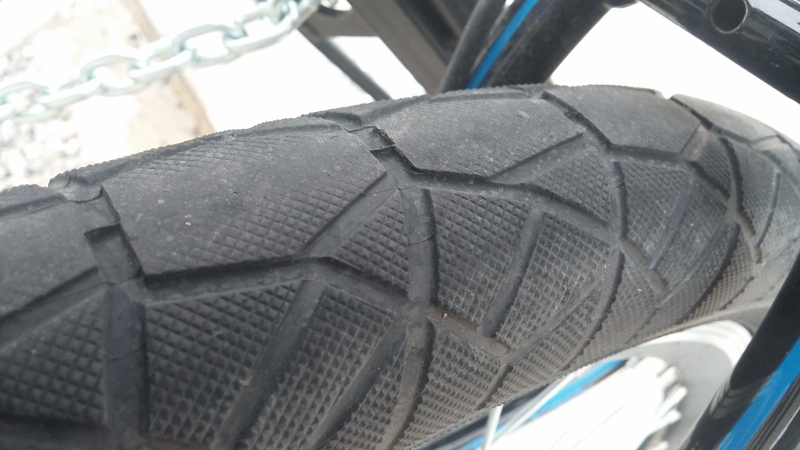 CST Cyclops rear tire. Has about 1000 miles on it, I'll probably be able to get 2-3k more out of it. I can't remember exactly when I did it and I didn't post about it (wasn't long after getting these tires), but I have another tire inside it for extra puncture resistance. 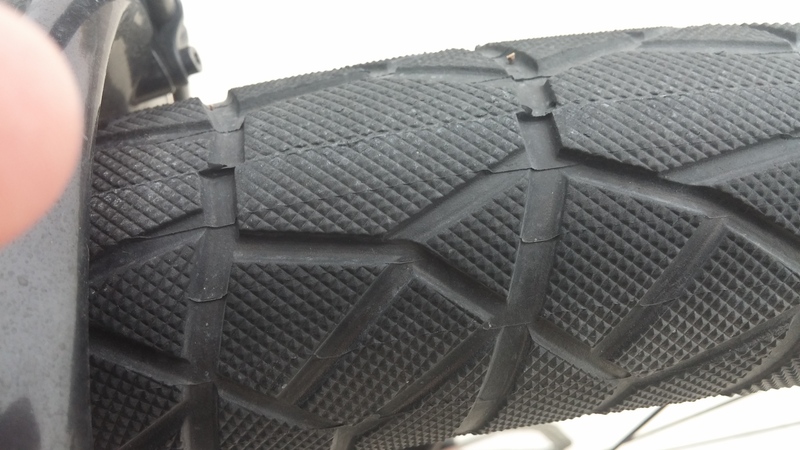 I took the 26x1.7" or 1.9" tire that came with the ebike kit, cut the beads off it, and stuffed it inside the 2.4" Cyclops. Gives me at least a quarter inch of rubber before even getting to the tube. I ran it most of the 1000 miles without Slime in the tube and it held air better than the Slimed front tire. I added Slime a couple weeks ago as an added precaution. CST Cyclops front tire. I ran the stock knobbie for a while, so this tire only has ~800 miles. Looks like it should be good for 5-6k miles. Posting to end my break from EM and a little update on the ebike. At about 1250 miles on this kit, or about an average of 20 miles a month since I last posted about it. Good news is I moved to a much more bike friendly city, so biking/ebiking is a viable option for most of my local travel. Bad news is I only live a mile away from where I now work, so ebike miles from commuting won't amount to much more than the last 8 months' average. :P Mods done to ebike since posting are removing the rear rack (it never really fit right) and relocating rear light to the backpack and doing the trick of putting another tire between the tire and tube to the front wheel. Puncture hazards are much lower here, so I'm going to see about doing a cheap tubeless conversion similar to this to reduce weight and tire stiffness. Now I get to decide if I want to put another rim on my original kit and get another battery to use on my wife's bike, get plain road bike(s), or some combination. Ebike seems kinda silly when I could pedal pretty much anywhere local in under 30 minutes on mainly 25-30MPH roads. I do have to keep in mind that winter here will be much colder and actually have snow. Nice thread. I noticed it in your signature file in another thread. How has the double tire thing been working lately? Have you done the "red neck" tubeles thing? I haven't ridden the ebike in months. My wife and I work at the same place a mile from home with similar hours, so we take the Prius. I got sick of having to wear a ~20 pound backpack with the battery every time I wanted to ride, too. Couldn't justify buying a smaller battery, but I'm thinking of splitting my current battery and mounting half on each side of the top tube towards the front like saddle bags. Would provide much better weight distribution and I could either leave the battery with the bike or take it with me at my destination. Double tires worked great, but I removed them because there's just not much of puncture risk here. Haven't tried tubeless, but I probably will if I ever get another bike/ebike to dedicate to off road riding.